2013 Decimal Coins There are 74 products. 2013 Baby Mint Set – Dot and the Kangaroo. Like other Australian literary classics that the Baby Sets have featured, Ethel Pedley’s 1899 classic Dot and the Kangaroo painted a portrait of Australia as a place of great natural beauty, unique terrain and quirky, lovable animals. 2013 $1 ANZAC Day Coin - Australian Defence Force Engineers Uncirculated Coin in Card. Preserving the knowledge of wartime sacrifices made by our defence force is important to new generation of Austrlaians, as numbers attending ANZAC Day ceremonies testifies. 2013 $1 Australian Citizenship Uncirculated Coin in Card. 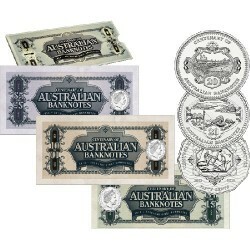 The Perth Mint is proud to announce the release of its annual 2013 Australian Citizenship $1 Coin. 2013 $1 Young Collectors ‘Experience It’ Series – Skiing Uncirculated Coin The 2013 Young Collectors ‘Experience It!’ series features six coins, each of which portrays an outdoor sport or leisure activity in which Australian kids love to partake. 2013 $2 Mini Roo 0.5gm Gold Bullion Coin This delicate, button-sized release presents a golden opportunity for anyone to own an iconic Australian coin. The design portrays a kangaroo in outback Australia and is struck from 99.9% pure gold. 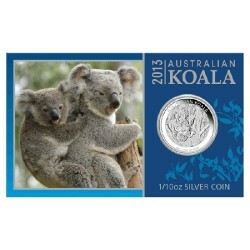 2013 10c Australian Koala 1/10th oz Silver Bullion Coin in Card. This delightful coin features original artistry and is struck by The Perth Mint from 99.9% pure silver in bullion quality. 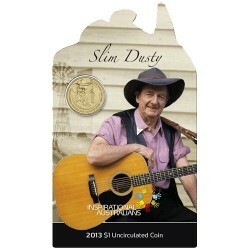 2013 $1 Inspirational Australians – Slim Dusty Uncirculated Coin in Card Known as Australia’s King of Country but born David Gordon Kirkpatrick, the name Slim Dusty has been synonymous with Australian country music for nearly seventy years. 2013 Mint Set – 6 Coin Uncirculated Year Set Since the discovery of the platypus, its story has evolved from a scientific curiosity to a national symbol. not only is it unique to our land, it is also one of only two kinds of monotreme, or egg-laying mammal, along with the echidna. 2013 Centenary of Australian Banknotes Three Coin Set The commemorative coins included in this set mark the Centenary of Australian banknotes. 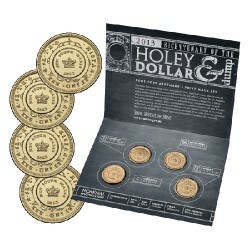 2013 $1 Bicentenary of the Holey Dollar & Dump Four Coin Mintmark and Privymark Set To commemorate 200 years of a nation’s first official currency, the Royal Australian Mint’s 2013 mintmark and privymark coin program will feature a replica of the Holey Dollar and Dump as the basis of design. 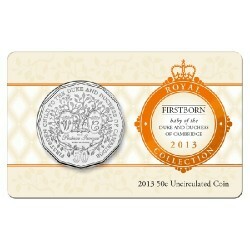 2013 50c Firstborn Baby of The Duke and Duchess of Cambridge Uncirculated Coin . In celebration of the birth of Prince George Alexander Louis, born on Monday 22 July 2013 at 4.24pm London time, the Royal Australian Mint will be releasing this beautifully designed coin in fine silver and cupro nickel. 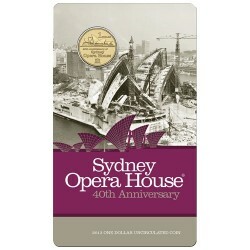 2013 $1 40th Anniversary of Sydney Opera House Uncirculated Coin in Card. When Her Majesty Queen Elizabeth II officially opened Sydney Opera House on 20 October 1973, the public life of one of the most iconic building in the world began.